Masahiro Setagawa, fifteen, has been rescued from running errands for a local gang of delinquents by Kousuke Ohshiba, older brother of his classmate Kensuke. Utterly smitten by the hero who’s changed his life, Masahiro has graduated from wannabe underling to Kousuke to boyfriend – even though there’s a twelve-year age gap and Kousuke is currently employed as a maths teacher at his high school. 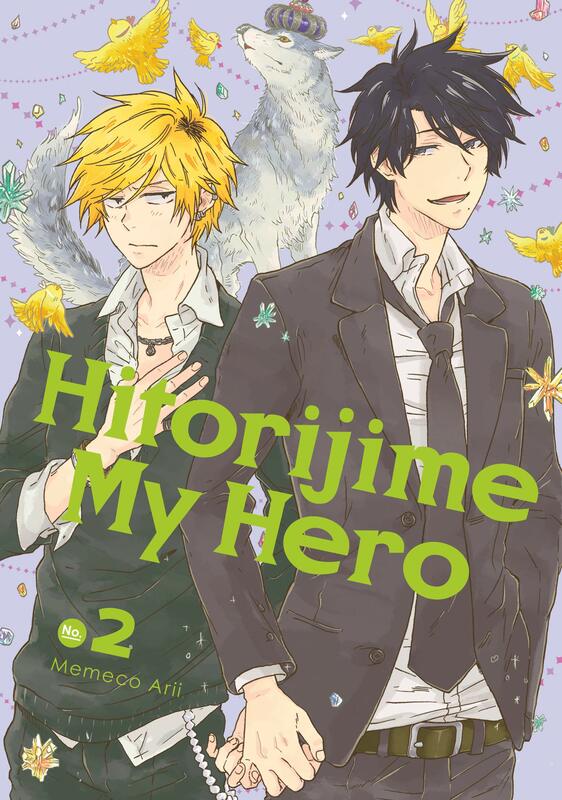 As we noted when reviewing Volume 1 of Hitorijime My Hero, mangaka Memeco Arii’s style has a wonderfully informal, sketchily cartoonish flow, slipping effortlessly from detailed and realistic close-ups of the characters to imagery more often encountered in children’s comics as faces melt with embarrassment or are shown super-super-deformed. This style suits the easy-going schoolboy banter really well, lending it a naturalistic flow as if the reader is eavesdropping on a group of high schoolers messing about between lessons. And now that Masahiro, who’s trying his best in spite of his straitened home circumstances, finds someone whom he really cares about – Kousuke – you can’t help rooting for him. When it comes to feelings, he’s honest, awkwardly sincere and touchingly naive. Okay, then we get into Love Hotel territory and we’re back in the old ‘uh-oh, should we be rooting for a relationship with a twelve-year gap between a teacher and a student?’ territory. And then… Kousuke begins to distance himself. It’s school examinations time and he’s overworked. Masahiro also detects a certain coldness in his attitude on the rare times when they cross each other’s paths. And when Kousuke tells him, “Let’s end this” Masahiro is devastated. Is it really the end? Has Kousuke done the ‘decent’ thing in ending this inappropriate relationship with one of his students? Masahiro’s response is so very relatable that it’s hard not to cheer out loud. While we know quite a lot about Masahiro’s family background (single mother) and his childhood (in spite of his falling in with a bad crowd, he’s really a good kid who cooks for his friends, holds down a part-time job and loves animals) – we don’t get the same level of insight into Kousuke. We don’t – yet – know what makes him tick. He’s treading a dangerous path (teacher-pupil romance) – and seems to be the kind of seme who enjoys making his younger partner uncomfortable by risking flirting in school. We get glimpses of him drinking at his favourite bar with his friends but not much else. And yet he’s also a committed and conscientious teacher and his relationship with his mother (it’s the Ohshiba household where everyone hangs out) seems refreshingly easy-going yet caring. At twenty-seven he must have gone out with other men and/or women but thus far, nary a hint as to who they might be and why it’s not worked out. By the end of this volume, suddenly it’s Christmas – but you could have been forgiven for not noticing (I didn’t get the full significance of the calendar with the 25th ringed on it until I read the very helpful Translator’s Notes at the end of the volume). The Translation Notes from Anne Lee are again not only helpful to explain cultural references but fun to read as well. The opening colour page is attractively painted in muted pastel shades that complement the palette used on the cover. And the mangaka’s ‘Thrilling and Suspenseful Afterword’ will amuse anyone who’s ever had been under pressure to make a deadline. 10 Dance is definitely manga for grown-ups; Inouesatoh’s love for ballroom dance shines through on every well-drawn page.